You can use the document section to configure the size of the WebGL canvas and grid color. These settings apply only while you are working on a scene in the editor, and to the published scene. 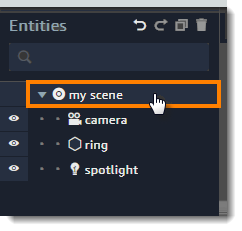 Open a scene in the Sumerian editor. Choose the root node in the Entities panel. Expand the Document section in the inspector panel. Grid – Change the color of the grid. Stretch – Stretch the canvas to its container. Aspect ratio – Stretch the canvas to its container, but keep the aspect ratio. 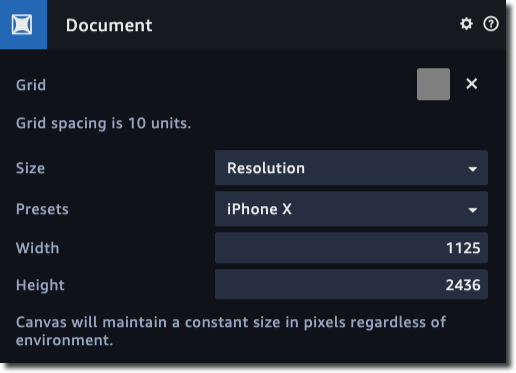 Resolution – Set a fixed size of the canvas.